The 28 year old Facebook CEO and founder Mark Zuckerberg married his longtime girlfriend, Priscilla Chan . It was a surprise ceremony at the couples home in Palo Alto, California on Saturday, May 20. The couple met while both were attending Harvard, and have been together for nine years. Chan graduated from medical school at the University of California, San Francisco, so the guests thought they were invited to celebrate Chan's graduation from medical school. Food served came from the couple's favorite Palo Alto restaurants, Palo Alto Sol and Fuki Sushi, and Burdick Chocolate “mice” for desert, which Chan and Zuckerberg had on their first date. According to a guest, the couple had been planning the ceremony for months, but wanted to wait until after Chan’s graduation. 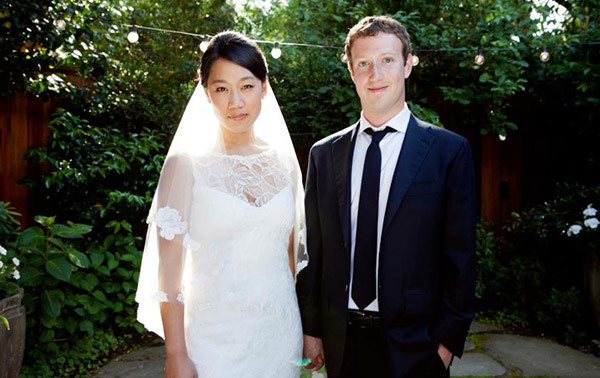 Mark Zuckerberg designed a simple ruby wedding ring and Chan had not seen it before the ceremony. "She's going to be a pediatrician so our dinner conversations are often about facebook and kids and the kids that she's meeting. She'll see them getting sicker and then all of a sudden an organ becomes available and she comes home and her face is all lit up because someone's life is going to better because of this," Zuckerberg told ABC News' Robin Roberts. Zuckerberg founded Facebook at Harvard in 2004. On her graduation day, Mark Zuckerberg had written on his Facebook page, "I am so proud of you Dr Chan." Oh, I've seen this news on Yahoo! as well. Lucky girl. Hehe.